Can we dim the house lights for a minute? "Poopers" the Japanese Hammie representin' with a tribute song: "Choppin' Broccoli"
Arigato, Chanse-san and Dana C.
And what a sweetie... Look at the ears... I wanna come home to that every night... *snorgle*!! I want to scoop up that Poopers! sooooo cute!!!! i want one!! Awwww, Poopers looks willing to share his broccoli treat with someone he loves! Who can resist buying broccoli when it's advertised like this? OMG!!! That shot is pure genius! How can anyone not love rodents? Delightful! what a sweet little face!!! I swear I didn't realise hamsters can be so unbearably cute until I found this place. I love hamsters. And I love broccoli. This is like, picture perfect squee material. 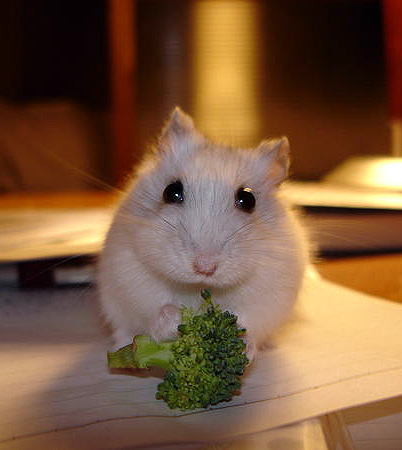 I'd share my broccoli anytime with that cutie. "What? THIS broccoli? No, I wasn't eating it.. I would never do that...I was...um...I was...bringing it for you!! Yea, that's it...I was bringing it to you!!! Oh, you don't want it? Well...can I have it then??" I think this hammie looks a bit nervous, perhaps because that is her bridal broccoli bouquet, or perhaps just because broccoli is the deadliest vegetable known to hamkind (It tries to warn you away with its terrible taste :o) Of course, I could be mistaking BEF + romantic mood lighting as nervousness. lol, i think you got it stormcat. it's that classic "what broccoli?" moment. LOL Betty, I wanna see a teeny tiny veil to go with the broccoli boo-kay! And a itty-bitty 3 tiered cake! The BEF is off the charts here. Perhaps that lil' hammie needs the roughage to feel a bit less...eye-bulgey? I wanna see the next shot...of Hammie with that piece of broc shoved in his cheeks! We *really* need to set up some celebrity interviews. Dana Carvey and Poopers on Cute Overload Late Night. That is so cute, but I will now have that song in my head. ALL DAY. By the way... mostly we'll just call the snake "Ed," of course. L-Rob -- OK OK, your kitty is cute! We get it... got anything *else* to say? OMG that ish cute! You can find some cute stuff at my website becuase I do some of the same things. Hope you check it out! Ceebs...I think we know who Poopers could hire to make the delicate, miniature wedding cake...Lucy's boy, Mathijs van der Paauw. I'm so glad that other people remember that hilarious Dana Carvey sketch!!!!! Great job, CuteOverload!!!!!!!! It's all about the broccolis. I love your choice of Dana Carvey song to represent your hamster. Gold. With respect for the Dana Carvey original shouldn't it be 'chomping' broccoli? On the topic of hamsters, I'm now completely off the charts in suspense about where Luna has gone on Baruchito's Homecage. I never cared a whit about hamsters before I tapped into CO. I mean, it *does* mention hedgehogs. Thankee Theo. btw, I'm planning to upload some new boxcar cat photos this evening. With informative captions! "Do expect this lightly sauteed in a wok?" "No, Mr. Bond, I expect you to fry!" One of the lesser known but my absolute favorite Dana Carvey sketch ever. Poor college cafeteria workers had to suffer my friends' and my "performance" every time they served us the vile weed. LaurieC, on your mommacat recommendation from Saturday, I'm thinking good thoughts for Luna. Aubrey -- Glossary has been updated. jaypo, knowing the bad luck Javi's had with his hamsters this year, I *was* fearing the worst. "Everything was going just the way i planned the broccoli was done" ba baaa naa naa. just realised you wont know what the heck im going on about.